Linking self-access and classroom learning is a difficult and time-consuming business, but one which can lead to great rewards as learners develop independent learning skills and assume greater responsibility for their learning. 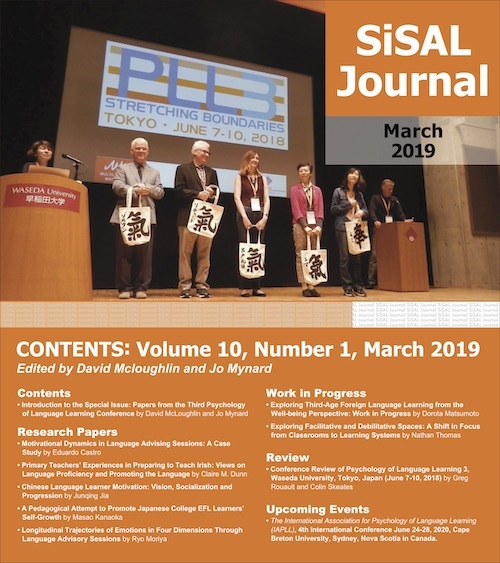 This paper will outline the approach for encouraging independent learning employed in the first year English language curriculum at Hiroshima Bunkyo Joshi Daigaku (HBJD), a four-year women’s only university in Japan. Two different methods for doing this will be introduced: employing project-based learning activities and linking classroom activities with a Self-Access Learning Center (SALC). The design of the curriculum and the materials encourage individualized learning, while the project-based and independent learning activities promote learner responsibility and control of learning (Dickinson, 1987) through utilization of the SALC. This paper will outline the issues involved in shifting from a weakly linked curriculum and SALC to a more strongly linked curriculum-SALC relationship. It will provide specific examples of this challenge before also discussing examples of the successes and failures that have been faced by the curriculum design and self-access teams in attempting to create a curriculum which strongly promotes independent learning. It is hoped that sharing these experiences will provide some useful insights into the issues surrounding the encouragement of independent learning and how these issues can be tackled practically in a teaching situation. The establishment of the Bunkyo English Communication Center (BECC) at Hiroshima Bunkyo Joshi Daigaku (HBJD) was a collaborative project between Kanda University of International Studies (KUIS) and HBJD that utilized the knowledge and skills of KUIS in helping HBJD to establish a new language curriculum and Self-Access Learning Center (SALC). There were numerous challenges in creating the new center, and this paper focuses on efforts to integrate self-access into the curriculum in response to the new educational environment. The paper will begin by briefly summarizing some of the key challenges faced in establishing the BECC, before introducing the rationale for encouraging autonomous learning capacity using a self-access approach. The paper will then outline the differences in the relationship between KUIS’s SALC and curriculum and the BECC’s SALC and curriculum before moving on to a discussion about the ways in which self-access is linked with the Freshman English curriculum at the BECC. Two methods for linking the SALC and curriculum will be discussed: 1) the use of self-access activities which supplement classroom work and 2) the use of SALC resources in projects that learners are required to complete as part of their courses. Finally, the paper will conclude by suggesting areas for future research and development with respect to self-access integration into the curriculum based on the 1st year experience of the BECC team. The BECC Freshman English curriculum was designed to develop language proficiency and autonomous capacity. The contents and philosophy of the curriculum reflect the KUIS Freshman English program which emphasizes individualization, interdependence, and interaction as key components in the learning process in creating a learner-centered curriculum. The majority of learners at HBJD major in psychology, nutrition, welfare or early childhood education with only a small number majoring in languages. Irrespective of their major area of study, all first year learners are required to complete the BECC Freshman English program. Research into learner beliefs and attitudes towards English language learning at the BECC (Foale & Gillies, 2008) indicated that a significant number of learners have negative attitudes towards language learning based on their prior experience and perceived failures. This has led them to believe they will never be successful language learners, and may be an example of how “pessimistic explanatory styles” (Peterson, Maier, & Seligman, 1993) can lead to feelings of helplessness. As a result, many BECC learners have little experience, or interest, in autonomous language learning. Debates about improving language education continue in Japan with reform movements including the Japanese Ministry of Education, Culture, Sports, Science, and Technology (MEXT) “Action Plan to Cultivate Japanese with English Abilities” (MEXT, 2002, 2003) and the establishment of gakushiryoku or ‘General Graduate Competencies’ (see Figure 1). 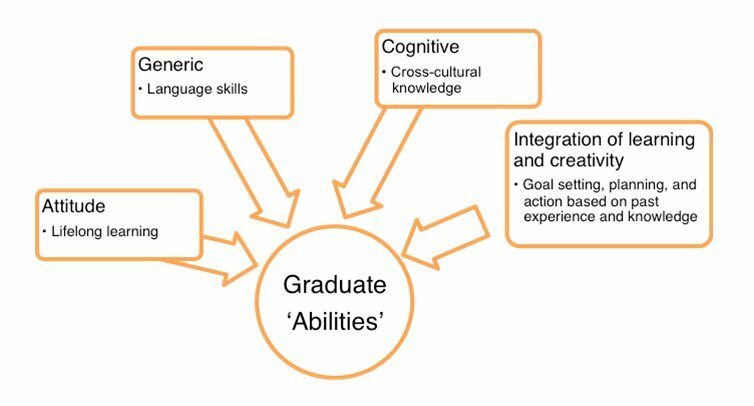 Gakushiryoku is the term used to describe the MEXT’s advisory that university graduates should have core competencies including basic foreign language ability, lifelong learning skills, problem solving skills, and sufficient autonomous learning capacity to be able to make decisions about future learning based on evaluations of past learning experiences. The BECC was charged with not only developing students’ basic English proficiency, but also their cross-cultural awareness and understanding, and skills for planning, and evaluating learning in line with the principles of gakushiryoku in developing lifelong learning skills. For HBJD, the gakushiryoku movement is one of the key drivers for instigating the collaborative project with KUIS to establish the BECC language program and SALC, given KUIS’ strong support of autonomous learning and self-access, which was recognized as a “Center of Excellence” by the Ministry of Education in 2003. Figure 1. Autonomous learning in gakushiryoku. As Benson (2001) explains, autonomy is usually considered to refer to three interdependent areas concerning the capacity of learners to take control of their learning. These three areas are the learners’ cognitive processes, the management of their learning, and the content of their learning. Regarding the practice of autonomy, Gardner and Miller (1999) explain how self-access centers are successful in providing structure for the development of autonomous learning capacity by providing a space which allows learners the opportunity to interact with the learning environment in unique ways in order to address their learning needs in a personal manner. The two-part rationale for self-access is that it is a pragmatic response to the individualization of education and, ideologically, it promotes learner independence (Sheerin, 1997). The challenge for developing autonomous learning capacity is encouraging and equipping learners with the skills and confidence to start moving from teacher dependence towards a state of greater autonomy in which they are able to take greater control over their learning. Gardner and Miller (1999) outline several possibilities as to how a SALC may be linked with the curriculum, ranging along a continuum from no direct links or integration between the SALC and curriculum to a fully integrated SALC and curriculum. At KUIS there is a weak link between the SALC and the curriculum. Although there are programs in place, such as extra learning modules which link the SALC and curriculum (Cooker & Torpey, 2004), learners are not required to participate in these programs or to use SALC resources as part of their curriculum. As the BECC SALC was originally based on the KUIS model, a weak relationship between the BECC SALC and the curriculum was initially established. However, it soon became apparent that the extent to which learners recognized the benefits of self-access learning was a unique part of the KUIS university culture rather than a universal trait. We were faced with the task of considering how to encourage autonomous learning behaviors for non-language majors, who had a wide range of abilities and were in “different stages of the life-long learning process” (Morrison, 2008, p. 126). This involved a re-conception of our place in their hierarchy of educational needs, as despite the availability of the BECC’s self-access learning center, usage data continued to show few learners making use of it. Our experience in this regard followed that of Hess (1996) and Benson (2002), as we also naively “thought that learners of English … would respond enthusiastically to self-access” (p. 3). This led to the conclusion that we needed to develop clearer pathways (i.e. referring learners to specific resources or materials) into the SALC. As Kell and Newton (1997, p. 52) explain, pathways can operate as a “map” for “lost” learners, a “stepping-stone” for learners with low confidence, and a “release” for bored learners. Cotterall and Reinders (2001) explain that the SALC can function as a bridge between what Crabbe (1993) refers to as public-domain learning and private-domain learning by linking the shared learning that is carried out in class with the learners’ individual private learning. There was a need to highlight to learners the links between their public and private learning in order for them to see the benefit of using the SALC and to reduce their anxiety towards using the SALC. It was also felt that a more structured approach to encouraging autonomous learning development was required, as the HBJD learner group risked being overwhelmed by too much choice. Aldred and Williams (2000), appear to have experienced the same issue during the development of a self-access program in Hong Kong where they found there was “too much choice for students” (p. 86) and that giving more direction to learners in the form of recommendations or pathways helped to avoid paralysis of choice by learners. In the KUIS institutional culture, with a relatively sophisticated language-learner population, this problem was not evident. However, in the BECC context, a more structured approach was seen as vital in developing learners’ awareness of different ways of learning and of controlling their learning. While a strength of self-access learning is that it is flexible and can be tailored to match the needs of the learners (Gardner & Miller, 1999), doing so effectively presented a major challenge for the team charged with implementing the new curriculum and establishing the SALC. The first step identified by the BECC teaching and learning advisor team was to provide learners with more opportunities to take greater control of their learning, and as much as possible, a self-access approach (Serra Salvia, 2000) involving the use of the self-access center was the preferred means for providing these opportunities and developing autonomous learning capacity. As Benson (2001) explains, “any practice that encourages and enables learners to take greater control of any aspect of their learning can be considered a means of promoting autonomy” (p. 109). Two approaches for fostering the development of autonomous capacity by linking the curriculum and SALC were selected for implementation:1) the creation of pathways into the SALC through extension activities, which were a part of curriculum materials and assessment, and 2) the provision of specific project support materials in the SALC, which provided learners with resources for completing in-class presentation preparation and planning. While this “coercion” of the learners to engage in self-access learning can be seen as a contradiction of autonomous learning capacity development by “forcing” learners to become consumers of products selected by others (Benson, 1994; Malcolm, 2004), it was considered that in order to foster autonomous learning capacity, some orientation to the center (Navarro Coy & Brady, 2003) was required first in order to facilitate learner development later. As Sheerin (1997, p. 60) explains, “training” differs from “development” in that training involves “something that is done by someone to someone else” while development is cognitive and “involves accepting responsibility for one’s learning”, and we believed that development would not occur for most of our learners without some training to structure the process. For students who have never previously taken control of their learning, moving towards greater control is a very challenging process. To support this process, the classroom materials were directly linked with material and resources in the SALC through the use of extension activities and projects – with the goal of giving learners some choice and control over some of their language learning, ideally in a manner that reduced learner anxiety and resistance to a new learning environment. The SALC Extension Activities were developed to connect to the learners’ classroom study and were designed to serve as an ongoing orientation to the SALC and its resources. These activities were completed outside class time and required learners to make choices about which activities to complete, when to visit the SALC, and who to work with. Some of the activities could be done individually, while others needed to be completed with a partner, in a group, or with a learning advisor or BECC teacher. For each activity different resources in the SALC were utilized and learners were directed to specific resources or areas. These activities built upon what the language learners experienced in class, and were designed to provide further practice in a freer environment. As Gardner and Miller (1999) explain, project-based learning can be an effective method for helping to move learners towards autonomy through cooperating with their peers and managing their learning, as “although a project may be started in class, learners could use self-access facilities and libraries to continue their work” and “in this way classroom-based learning can be linked with a self-access centre” (p. 167). It was considered crucial for integrating self-access to make it an authentic experience for learners and to encourage learners to use the self-access center by making it the obvious choice when researching projects without making the use of the center compulsory for completing the project. This was achieved by setting the learners’ project preparation tasks which could be completed using only web-based or other outside resources, but at the same time learners were made very aware of the print and multimedia resources available in the SALC in the hope that they would use these instead. Furthermore the center’s design – with “Group Access” areas and “Multi-purpose” rooms – provided ideal spaces for carrying out project work. Learners’ awareness of SALC resources and equipment was raised and developed through the self-access extension materials, so that when learners were presented with research projects, they had a foundation of understanding about the center which they could use to make an informed choice about using the center for their project work. While identifying areas for encouraging autonomous capacity development by more strongly linking the SALC and curriculum was relatively easy, the process of implementing the initiatives varied. In order for such a system to be successful, the materials purchased, display policies and resources developed had to be reconsidered with a view towards supporting the curriculum materials. The project-based initiative was integrated smoothly and was immediately successful. However, with respect to the extension activities, the implications on the relationship between the curriculum and self-access center quickly become apparent. The challenges faced in moving from a weakly-linked SALC and curriculum to a strongly-linked relationship will be discussed in the next section. What Happens When You Change the Relationship Between the SALC and Curriculum? As Pemberton (2007) states, self-access must “support, but not direct, our students’ learning” (p. 42), and we found balancing “varying degrees of guidance” (Gardner & Miller, 1997, p. 17) difficult to manage at first. The immediate positive impact on the self-access center was a far greater number of learners using the center and materials. However, soon strains were observed on materials, staff time, infrastructure, and budget. These strains highlighted that changing the relationship between the curriculum and SALC had implications which affected the center as whole, and required attention in order to facilitate the change. At a management level, the SALC needed areas for displaying materials for each subject, and these materials needed to match the requirements of the learners completing their projects. Thus, greater communication between the teaching staff and SALC learning advising team was essential for ensuring the materials in the center matched the objectives of the curriculum. In terms of materials, pathways act as a ‘controlled-access system’ (Miller & Rogerson-Revell, 1993) which introduce learners to the center. Providing specific pathways into the SALC gave even the most reluctant learners a clear reason and objective for using the center. However, with the introduction of such materials, the burden on certain sections in the SALC, and specific books, items, or resources within those sections, soon led to the realization that the pathways into the SALC materials had to be general enough to allow for a large number of users at one time, and also that choice was the crucial first element in encouraging autonomous learning development. Staff time also became an issue, as supervision for the SALC extension activities involved requiring a learning advisor or teacher to initial the activity once learners had completed it – something which seemed reasonable to the materials design team. However, in practice this led to a steady stream of learners at learning advisors’ doors, which meant they were too busy to help the learners interact with the materials in the self-access center, provide guidance for learners in need, and facilitate better understanding of the learning process – their core duties in helping to support learners in their self-directed learning (see Mozzon-McPherson, 2007, for more about Learning Advisor roles). There was also an impact on infrastructure. The sudden increase in learner numbers led to long lines waiting for the photocopier, computers, voice recorders, or video cameras, and at busy times every seat in the SALC was full. It quickly became apparent that although the extension activities allowed learners a structured means of experiencing the SALC resources and controlling aspects of their learning, overly specific SALC activities were also reinforcing learners’ poor experiences with language learning as the SALC resources and infrastructure were pushed beyond its limits. Usage soared, but the center became too crowded at peak times, and resources required to complete the activities were not always available. The process of establishing any curriculum or self-access center will necessarily involve a large amount of trial and error in meeting the needs of the local population. In moving from a weakly linked SALC-curriculum relationship to a strongly linked relationship through the use of SALC extension activities and project-based learning activities, the BECC program has moved the self-access center to a central position in the curriculum itself. Through the ongoing orientation to the SALC and independent learning that the extension activities provide, a much greater number of learners are using the SALC resources and being exposed to opportunities to take greater control over their own learning, and more learners are making use of the SALC in their project learning. However, more users of the SALC does not equal more autonomous learners, so the challenge for the project is to build upon the awareness raising measures outlined in this paper with further practices for fostering autonomy and finding some means for investigating what, if any, changes are occurring in learners’ beliefs or behaviors. Suggestions for Further Research: Does the Practice Help Learners to Take Greater Control Over Their Learning? At the conclusion of its inaugural year, the BECC program is continuing to strive for the most effective means of introducing all learners to the concept of autonomy and providing them with opportunities to exercise greater control over their learning. These opportunities are introduced via the curriculum in the form of SALC extension activities and projects. However, more opportunities and practices for fostering autonomy continue to be considered, such as better utilizing the educational technologies available and working towards an individualized curriculum. While these opportunities are important, Benson (2001) reminds us that the key question to ask of any practice that claims to foster autonomy is, “How does this practice help learners to take greater control over their learning?” (p. 111) Therefore, research is required to examine how effectively the approaches introduced enable learners to take control over their learning and to determine whether they are able to recognize that they are developing their autonomous capacity. Research could also explore whether more learners are using SALC resources of their own initiative and for what purpose, whether their beliefs towards language learning are changing, and most importantly, if intrinsic motivation is being generated by providing learners with more opportunities to learn in different ways and take control of different aspects of their learning. Gene Thompson is the Curriculum Director at the Bunkyo English Communication Center at Hiroshima Bunkyo Joshi Daigaku. His research interests include curriculum development, self-efficacy, and beliefs about language learning. Lee Atkinson has taught English to speakers of other languages in Australia, Hong Kong and Japan. She has an M.Ed in TESOL and is currently teaching at a Hiroshima Bunkyo Joshi Daigaku. Her research interests include second language writing, CALL and autonomy. Benson, P. (1994). Self-access systems as information systems: Questions of ideology and control. In D. Gardner & L. Miller (Eds.). Directions in self-access language learning. Hong Kong: Hong Kong University Press. Cooker, L., & Torpey, M. (2004). From the classroom to the self-access centre: A chronicle of learner-centered curriculum development. The Language Teacher, 28(6), 11-16. Crabbe, D. (1993). Fostering autonomy from within the classroom: The teacher’s responsibility. System, 21(4), 443-452. Foale, C., & Gillies, H. (2008, November). Half full or half empty? In G. Murray (Chair), Interweaving Self-Access and Classroom Language Learning. Symposium conducted at the JASAL Forum at the JALT 2008 Conference, Tokyo. Hess, H. W. (1996). Computer-based support for foreign language learning. Foreign Language Teaching (Daxue Waiyu Jiaoxue Yanjiu), January 1996, pp. 102-107. Johnson, F.C. (1989). A new university, a new learning system, a new set of instructional materials – the Kanda experiment. Kanda University of International Studies Journal, 1, 31-53. Kell, J., & Newton, C. (1997). Roles of pathways in self-access systems. ELT Journal, 51(1), 48-53. Malcolm, D. (2004). Why should learners contribute to the self-access center? ELT Journal, 58(4), 346-354. Miller, L., & Rogerson-Revell, P. (1993). Self-access systems. ELT Journal, 47(3), 228-233. Morrison, B. (2008). The role of the self-access center in the tertiary language learning process. System, 36, 123-140. Mozzon-McPherson, M. (2007). Supporting independent learning environments: An analysis of structures and roles of language advisers. System, 35, 66-92. Navarro Coy, M., & Brady, I. K. (2003). Promoting learner autonomy in self-access centers: The key role of material. ELIA, 4, 69-86. Peterson, C., Maier, S. F., & Seligman, M. E. P. (1993. Learned helplessness: A theory for the age of personal control. New York: Oxford University Press. Serra Salvia, O. (2000). Integrating a self-access system in a language learning institution: A model for implementation. Links and Letters, 7, 95-109. Sheerin, S. (1997). An exploration of the relationship between self-access and independent learning. In P. Benson & P. Voller (Eds.). Autonomy and independence in language learning. Harlow: Pearson. Thompson, G. R., & Foale, C. J. (2008). Adapting the BEPP model: The BECC project. Studies in Linguistics and Language Teaching, 19, 253-289. For more about the BECC project, see Thompson and Foale (2008), while for about the educational philosophies of the Freshman English curriculum at KUIS, see Johnson (1989), and Cooker and Torpey (2004). For more about the Action Plan to Cultivate Japanese with English Abilities, see MEXT white papers and reports (2005, 2006a, 2006b).